Sometimes, getting away for the holidays ends up being more trouble than it’s worth. Besides, if you stay in Washington, you get some of the best 4th of July fireworks anywhere. 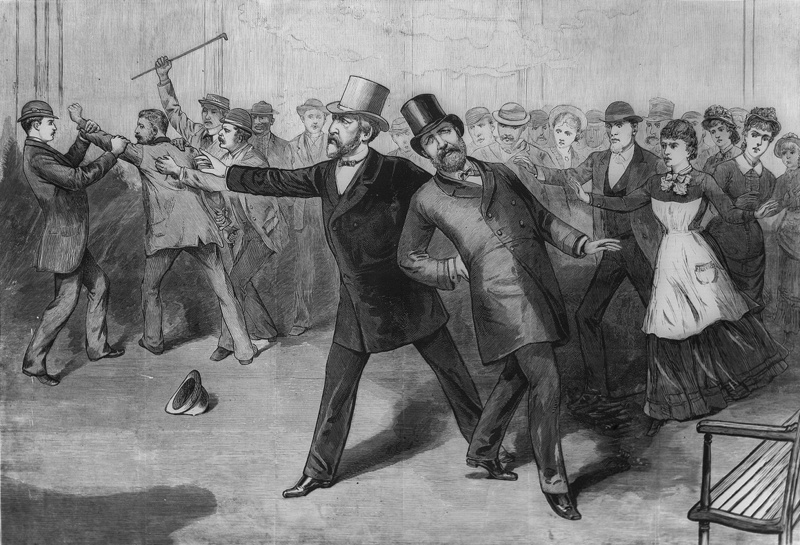 Back in 1881, President Garfield headed to the train station to get out of DC on Saturday, July 2nd, but it didn’t work out very well for him at all. Just short of four months of his inauguration, President James Garfield (BG, USV) was gunned down on Saturday, 2 July 1881 at Penn Station in Washington, DC. Penn Station stood at 6th & B Streeet, Northwest, which is now 6th & Constitution and is the location of the West Wing of the National Gallery of Art. Garfield died on 19 September. Historians rightly place much blame on his early treatment, during which doctors probed his wound with their unsterilized fingers in an attempt to find the bullet. If you’ve ever wondered what it’s like for a fashion-conscious Manhattanite to experience a dose of Navy SEAL PT, check out the Thirty Vintage Chick’s What Stilettos, ‘Hump Day’ & $20 Have in Common. Make sure you also check out Cooking with the Troops, where she is directing everyone to head with donations. If you’re interested in wine advice, especially if you live in Ireland, read Grapes of Sloth. My favorite post right now is Wine Merchant Can’t Really Think of suitable wine for Father’s Day Gift. Sharing my interest in wine and history is Canadian Karl Kliparchuk, whose Wine With Karl at MyWinePal includes a good post on his recent visit to Juno Beach. I have been studying French during my daily commute (I went from a 15-foot commute while working from home to drivng 62 miles each, so it was a sudden and dramatic change.) I recommend the Pimsleur course very highly. I’ve got the first 16 lessons on CD, but will be adding more via MP3 shortly. I really gets you right into speaking French as you would while there. I had tried just using books, which didn’t work. I had tried Rosetta Stone, which frustrated Melissa because she was sure she would never say “le chat sur la table” in conversation with a Frenchman. You can buy Mp3 lessons as few as 5 at a time, which is a week’s worth. If you’re smart you WILL study one lesson EVERY day, as it builds up fast. While reading a review of Saving Private Ryan, I thought of a quote from JFK’s inaugural: “Let every nation know, whether it wishes us well or ill, that we shall pay any price, bear any burden, meet any hardship, support any friend, oppose any foe, in order to assure the survival and the success of liberty.” Happy birthday, America.